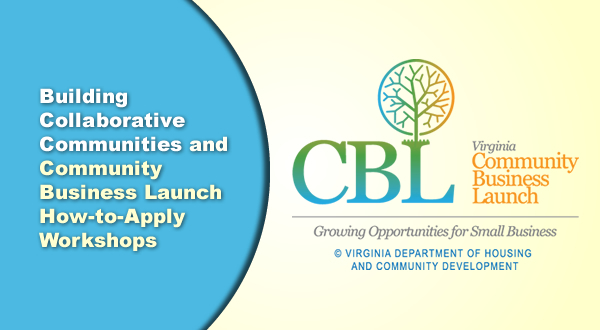 The Virginia Department of Housing and Community Development (DHCD) has announced funding is available for the Building Collaborative Communities (BCC) and Community Business Launch (CBL) programs for fiscal year 2015-2016. DHCD grant programs offer flexible resources to do more across your community and region. Register below for one of the how-to-apply workshops to learn about the programs, the successful projects they have funded in the past, program changes for the coming year and how you can best position your effort. Building Collaborative Communities (BCC) provides resources and technical assistance to distressed regions to stimulate job creation and economic development while building community capacity and leadership. Grants must be multi-jurisdictional and can fund a range of projects and activities which will foster regional economic growth and increase collaboration and investment from a broad and diverse contingent of stakeholder groups. The Community Business Launch (CBL) is designed to assist communities in taking a systems approach to building an asset-based small business development strategy. The program starts with a community’s unique vision for its future and then uses a local business competition to find and foster the entrepreneurs that connect with that vision. The CBL offers financial and content resources, guidance, and a learning network of communities pursuing similar strategies. By designing your own CBL, you can help your community develop a coordinated, comprehensive sustainable environment that identifies, launches and supports community-based entrepreneurs. Please register at least three days before the workshop to receive the location address and additional details. If you are unable to attend a workshop, please contact michelle.d.jones@dhcd.virginia.gov for additional details.